KE:Tactics takes core game play elements from real-time strategy, tactics, and role-playing games and combines them into a game that is painfully easy to pick up and play without committing your entire life, unless you have no life...in which case you may not find Kingdom Elemental to be an adequate substitute. Kingdom Elemental features nigh unlimited number of possible tactics by pitting combinations of your upgradeable heroes and their unique abilities against hordes of unique enemies like GIANT RAT MOBS! Everyone loves giant rat mobs with their secret furry pockets full of gold and armor! Seriously no giant rat mobs, but thARR be Pirates! Giant War Pigs! A crypt full of living dead who are just begging to be killed.....again. Knights who no longer say "Ni! ", a Flaming DOOM bear who would like nothing more then to BBQ you for lunch, and so much more! The demo is free to check out so you have nothing to lose...except maybe your soul. In short Kingdom Elemental Tactics is like a whack to the head with a +8 Sword of Awesomeness! Give Kingdom Elemental as a gift for download! 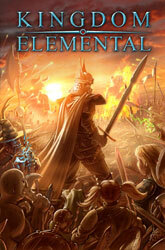 Immediately after ordering Kingdom Elemental you will be sent a keycode and download instructions. Read more! Waves of fast-paced action-packed tactical combat! Dazzling spells, characters, and special fx! Easy to learn interface has you fighting battles in minutes! Narrated tutorial teaches you everything you need to know. Addictive unlocking systems will keep you coming back for more! Skirmish mode for unlimited gameplay! Destiny mode with endless waves of enemies, how long you can last! Over twenty built-in challenge levels for even more action! Create your own challenge levels and share them with friends! Download community created challenge levels! Rich vibrant battle fields, full of life and special effects! Ten unique heroes, including: Pirates, Monks, Druids and more! Dozens of unique monsters including: The Dread Knight, the Hook Lord, War Pigs, Warg Riders and many more! GamersInfo.net - "$10 is a great price for an intriguing game"
Rock Paper Shotgun - "It's quite fun"
games32.com - "solid gameplay and the overall quality"
Amped Gaming - "surprisingly enjoyable"